This vintage tangerine pie recipe comes out of my recipe box every summer. Why? Because it's citrus flavor packs a refreshing punch on a hot summer day. Offering many homemade dessert recipes for you to try above and at the bottom of the page. PREHEAT oven to 350 degrees, bake your pie crust and completely cool. Combine 1/2 cup sugar, cornstarch and salt in top of double boiler; gradually blend in water. Cook over boiling water, stirring constantly until thickened. Cover and cook 10 minutes longer, stirring occasionally. Beat together egg yolks and 1/2 cup sugar in a bowl. To proof eggs, add 1/4 cup hot mixture into the egg yolk mixture first and then slowly add this egg mixture into the double boiler. Cook over boiling water for 2 minutes, stirring constantly. Remove from water; add butter, juice and zest. Cool. Pour into baked pie shell. 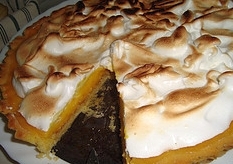 Top with meringue which has been prepared with egg whites and remaining white sugar. Bake for 15 to 20 minutes, or until top is golden brown. No tangerines available? Just use oranges. I have many more vintage pie recipes at the link below.